Open 08:00-19:00. This piano is designed by Themba Mkhize. I just loved the setting in the gardens ! A d lots of lovely people came and had a piano lesson with me.. 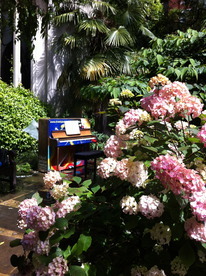 Here is the lovely piano in the gardens at St Dunstan in the east. A garden worker on his lunch break on July 10th. Taken on a visit to London with my niece and great nephew. The soft melody played added to the mystique of this unique place.